Shrine Social Media Chief Joe Slab conducted this interview with artist Brett Booth about his work on Aquaman. Enjoy! -- rob! The Aquaman Shrine: First off Brett, welcome to The Aquaman Shrine! It's a pleasure to chat with you in light of Aquaman's action-packed 50th issue release today by Dan Abnett with art by yourself, Norm Rapmund and Andrew Dalhouse. Fan reaction to the news you’d be on art duties for the anniversary issue has been overwhelmingly positive and we are thrilled you made time to visit! TAS: So tell us, how’d you get Aquaman? Did you have to competitive pitch or were you wooed, recruited or just assigned the gig? BB: I was actually just about finished with my Flash run and was talking to Jim Lee about possible upcoming projects and he and Dan Didio really latched onto Aquaman when I mentioned it. The next Monday Brian [Cunningham, Justice League Group Editor] emailed me offering me five issues with Dan Abnett. TAS: From your initial reactions to Aquaman shared on Twitter, you had some apprehension about drawing the character, specifically his scale mail uniform? BB: I did a few tests with the scales, finally using Ivan's basic technique for them. 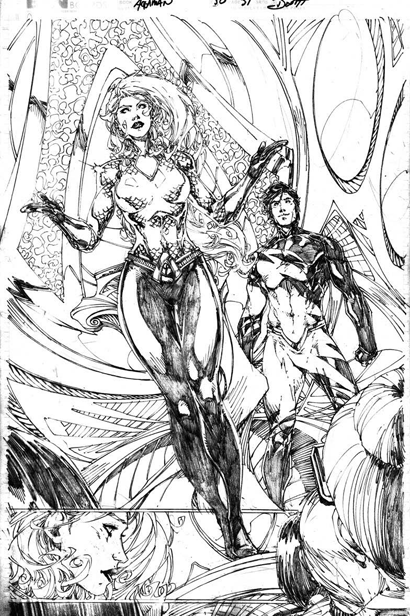 I'd only drawn Aquaman a few time before this--with other outfits so the scales were pretty new to me. Even with figuring out the best way to do them they still take a good deal of time. You have to focus when you do them and it can get a bit tedious if you aren't into that kind of thing. TAS: How did you approached the massive undertaking of a 40-page book with a character you hadn't worked on much before? BB: Badly! My initial idea was to simply break it into two parts, like two separate issues. Problem is most of the action happens from page fifteen on and I get bored drawing people talking for more than three pages so I broke that rule and started just drawing what I wanted to, slowly whittling down the pages. Took me an extra month to get it done. With no break between parts one and two it was taxing. Not as bad as Teen Titans Annual #1 but a close second! TAS: During the process of #50 what characters did you find most enjoyable? 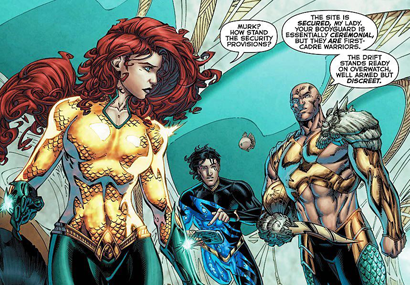 BB: Mera and Garth. They've been favorites of mine since I was a kid. It was great to finally get to draw them! 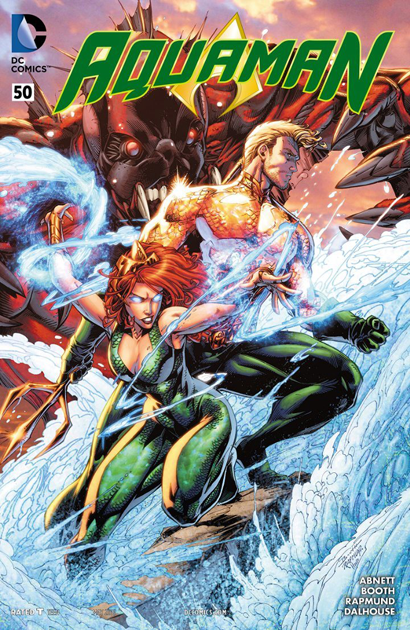 TAS: Ah yes, we know you're a fan of Garth/Tempest and your version of Mera in her Aquawoman mode is simply stunning from the preview art. What about drawing in an underwater environment? BB: Most of the underwater stuff take place at this new Atlantean base. So a few fish here and there but nothing that big. I did use the water as a way to make the hair flow a bit more, I have them sort of floating in the base and they move through the water so they can use all the space. We land-lubbers just use the surface of a space. Plus It allowed me to move people around a bit, Dan likes to have the characters conversing a lot so there is a back and forth with multiple characters that's tricky to do. The water makes it a bit easier. TAS: Dead Water is a new, original villain for Dan’s first arc--what went into creating his visual design? BB: I did a bunch of scribbles, a few basic designs and the final Dead Water's design was done. I liked the idea of not going completely humanoid. Everyone else agreed so we went with the one you'll see. TAS: To catch readers up, unfortunately you're only doing interiors for Aquaman as "guest artist" on #50 (out today as we may have mentioned!) as well as covers #48 through Aquaman's final issue #52 before moving on to Titans Rebirth--any regrets that your visit to The Seven Seas was so short? BB: Well, I'd say I'm happy to not have to do scales now, but Garth has them on his new suit! I do miss not being able to draw a bunch of undersea monsters, but never say never! TAS: Finally, doing a high-profile book that features the original Teen Titans (minus Kid Flash) is a dream job and we’re glad you’re staying in the Aquaman Family at least by extension. Do you feel like dropping any Titans teasers for the folks at home? By the way Brett, love Garth's new uniform, its sharp! BB: Thanks! Yeah one of the cool things with these Titans is the links to the JL and the Big Seven. Since I'm not that old, I always identified with the sidekicks more. So these characters are actually more favorites of mine than say Batman. TAS: Very Cool! Well thanks again Brett for stopping by our little corner of the DC Universe and we'll be looking forward to seeing what you and Dan have in store for Titans fans in a few months. Just a reminder--Aquaman #50 is out today and Rob will have his regular recap/review up later this week! Awesome. I remember when the New 52 was announced and ppl were like Aquaman won't make it past 12 issues or it will get cancelled once Johns leaves. I guess the Sea King showed them! I loved this issue and Brett's Aquawoman is beautiful. Sorry to hear you won't be drawing 51-52 but looking forwards to Titans Rebirth. Great interview. So excited about the issue that I downloaded it from Comixology first thing this morning, but I'll have to wait until after work to read it. My paper copy will come from my LCS by mail in my monthly shipment. Really intrigued by Garth in the new Teen Titans book. May pick it up to try. Will you review it Rob? Thanks, Darrin. LOVED Aquaman #50!!! More please. One question: Who is the Titan in green with the others? I can't identify. The one in green is Lilith/Omen. 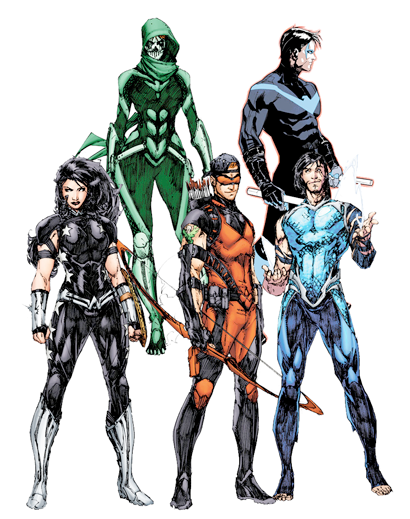 Hoping for some awesome stuff from Garth in Titans there a favorite of mine as well. I see them as their own team not a Junior JL or a Young Justice. The artwork, but especially, the colouring in this issue were absolutely beautiful. Couldn't wait to turn it around and read it again!